Do you sell dried willow for basket weaving? No. We only sell fresh cuttings for planting so that you can grow your own willows. See our selection on the willow cuttings page. Do you teach classes suitable for beginners? All classes currently scheduled are posted on the basketmaking classes page. You are welcome to sign up for our mailing list which you will find in the footer of the page to hear of any future classes. Katherine mostly teaches at various basketry group retreats and workshops. Do you take apprentices? Not at this time. 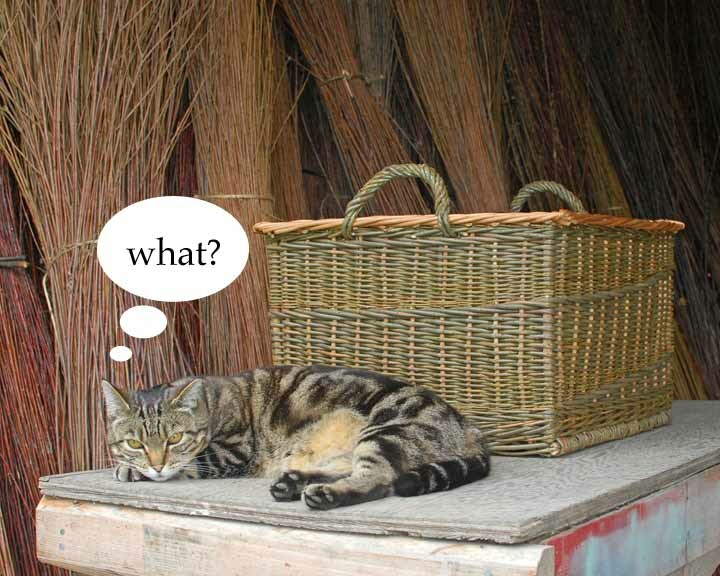 Do you make baskets to order? Yes. You can see a variety of basket forms and get an idea of prices by looking at the willow basket gallery. How do I order a willow basket? If you are not in a hurry, you can look at the willow basket gallery and email us with a request. If you need a basket immediately, you can look at the baskets in stock page and see what we have on hand. Let us know which one you are interested in along with a shipping address and we will give you a price including shipping. What kind of payment do you accept? In person we accept cash, check and credit card. For shipped items we can send you a PayPal invoice which has a link to pay on-line with any credit card or you can mail us a check made out to Dunbar Gardens. Do you sell and ship to Canada? We can sell and ship Katherine’s willow baskets to Canada. We do not sell willow cuttings to Canadian addresses.